THYSOL guarantees the highest quality standards are adhered to world-wide by holding to various quality marks. This guarantees that wether you are a patient or a thereapist you can have complete confidence in the THYSOL suite of products. Does your kinesiology tape tape carry the above listed required information? Why is it important to have products classed as medical or Class 1 products? When using products on a patients skin or if the patient has a compromised immune function it is important to know that only the safest materials are used. 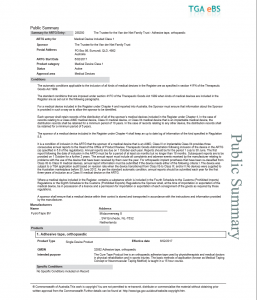 A therapist may ask “Will my product cause an adverse reaction or even worse an infection to my patient?” If there is a question regarding the product, can this particular product be traced? Has it been tested when applied to humans? A highly recognised standard world wide is the TÜV quality mark. Products are tested by TÜV Rheinland and undergo rigorous scrutiny to ensure they are suitable for medical use. 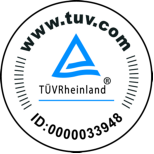 Each product must pass some 25 points of criteria before receiving the TÜV quality mark. TÜV Rheinland: “CureTape an elastic tape that meets the highest quality standards”. Wether you are a therapist, patient or athlete one thing is critical: the best medical care using the best materials available. To verify the quality of our product over and above the imitations we had TUV Rheinland test our products. TÜV Rheinland is one of the leading international suppliers of (technical) services for quality and safety testing. 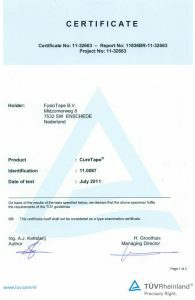 The conclusion of TÜV Rheinland: “CureTape is a safe, latex-free product that meets the highest quality standards”. 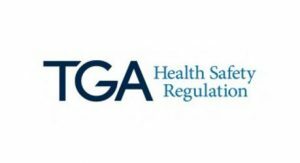 THYSOL’s products are sponsored and registered with the TGA. 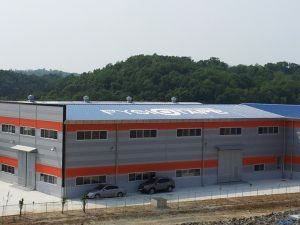 Proudly, the Curetape range of products are manufactured in our own factory in South Korea. This is yet another guarantee of the high standards which are maintained by the Thysol corporation world wide.